- West of Verdun the French 3rd Army launches a diversionary attack against Vauquois in support of the French offensive against the St.-Mihiel salient. - Concerned with the possibility that an Italian attack on Austria-Hungary might induce the latter to seek a separate peace with Russia, Falkenhayn has invited Conrad to Berlin for discussions today. On the issue of a separate peace, Falkenhayn is reassured that Austria-Hungary would not approach the Russians without first communicating with the Germans and asking for their participation. The two chiefs of staff also discuss the situation in the Carpathians and, despite the repeated requests of Conrad, Falkenhayn is unwilling to commit to the deployment of additional German forces to reinforce that front. The most Falkenhayn is willing to say to Conrad is that the question remains open as to whether the newly-raised Germans divisions can be most profitably employed in the West, the East, or against Serbia. Nevertheless, the deteriorating military position of Austria-Hungary, combined with the possibility of Italy and Romania joining the ranks of Germany's enemies, has Falkenhayn contemplating whether a more substantial German commitment to the Eastern Front is necessary to prop up their faltering ally. The German Chief of Staff still views a campaign in the Carpathians as foolhardy, and has no intention of sending German divisions to that front as Conrad desires. Falkenhayn is, however, more open to the possibility of a German offensive elsewhere on the Eastern Front. Today he asks General August von Cramon, the German military attache at Conrad's headquarters, to make inquiries regarding the condition of the railways between the Vistula River and the Carpathians, especially near the town of Gorlice. Falkenhayn emphasizes the importance of discretion, not to keep the Russians from learning about his inquiry, but rather the Austro-Hungarians: if German forces need to be shifted east for a major offensive, he intends this to be German-led operation, and does not want Conrad either interfering or demanding redeployments to the Carpathians. Such is the nature of coalition politics between Germany and Austria-Hungary. - In the central Carpathians the retreat of the centre and right of the Austro-Hungarian 2nd Army is completed today. Despite heavy pressure from the Russians, the Austro-Hungarians are able to establish themselves in their new defensive positions without significant mishaps. 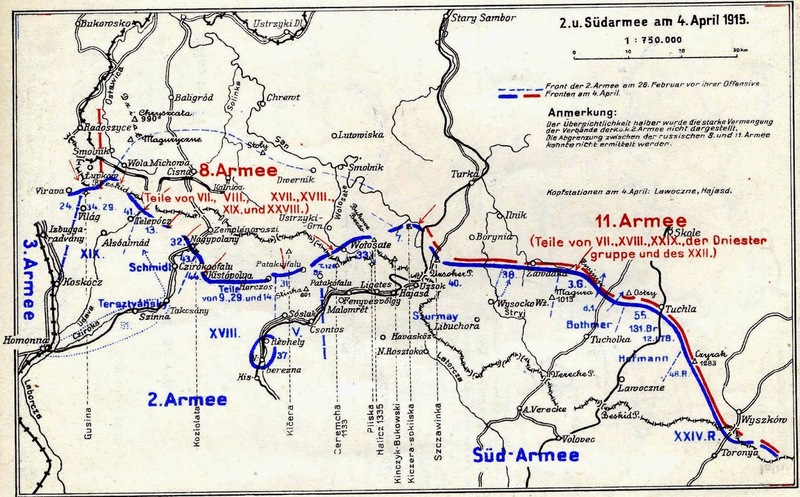 The position of the Austro-Hungarian 2nd Army after its retreat of April 2nd to 4th, 1915. At the far eastern end of the mountain range, the Russian 9th Army has been attacking the Austro-Hungarian force under General Pflanzer-Baltin for several weeks, attempting to cross the Dniester River. The Russian objective is the city of Czernowitz, the capture of which may induce the Romanians to adopt a more positive line towards the Entente. Though the Austro-Hungarian defenders have been outnumbered, they have been able to prevent a Russian breakthrough. Today a Russian attack forces back the right wing of XI Corps, but the timely intervention of 93rd Division not only halts the enemy advance but succeeds in recovering the lost positions by nightfall.